Is it possible a company can trick customers into thinking a product is of higher quality than it really is? Sure! Salespeople have been accused of doing this since the dawn of selling (likely back to the beginning of commerce thousands of years ago). 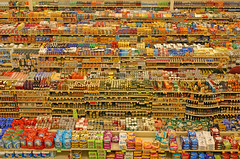 Advertising is another culprit with claims of manipulating a product’s true value by using trick photography and, more recently, computer-generated images (CGI). Yet, promotion is not the only way to paint a high-price image of a product that may really be less valuable than it appears. As discussed in this story from Time, several researchers suggest product packaging can also play a crucial role when it comes to customers’ perception of the worth of a brand. It is interesting to see what elements of a package are key to affecting customers’ perception. As discussed in the story, these elements include visual cues that come from the colors and the texture of product label. Also, perception may be impacted by design features, such as how the package feels when held and whether the package presents a functional appearance. Finally, the sound the packaging may produce, such as a pop when the product is opened, may send certain signals such as freshness or security. Together these factors not only convince customers that products are high-quality, these also pursued customers to accept the product at higher prices compared to competitors offerings.